Please refer to our stock # TC355 when inquiring. 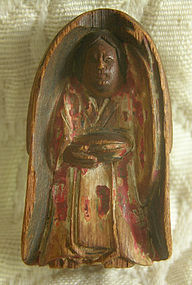 Finely carved and once elaborately painted, this antique figure was probably from a small shrine. Clearly used and handled over the years, piece still has some areas of original paint. Some residual of an inked signature on bottom. carving may be of a monk or other religious figure. Stands about 2 inches high.